I didn�t know any of the names of these women composers and that, of course, is Gasparo�s point. They would have been active as harpsichordists and/or singers in London salon rooms and composition would have been an almost inevitable corollary of their performing lives, an impulse social convention would dictate ceased on marriage. Most of the music adheres to the expected spheres of influence � Haydn looming large � though there are also moments of quirky individuality that stay in the mind. The anonymous composer known as A Lady was a dab hand at the prevailing French style in her Lesson VI with the best movement reserved for last � a pleasingly charming minuet with an intriguing lack of symmetry about it. Cecilia Maria Barthelemon was the daughter of an Anglo-French musical family � her father was a violinist and her mother a well-known singer, with whom the young Cecilia used to perform on stage. Her c. 1794 Sonata was dedicated to Haydn, a family friend. There are some arresting moments, full of contrasts and some quixotic, if not downright eccentric, directions taken. In this humour is never far away and if the Adagio, though intense, never quite convinces and if the hornpipe finale is rather generic we still have the recollection of that arrestingly strange Allegro Vivace. Maria Park was the daughter of the first oboist at Covent Garden where she made her debut aged ten playing the piano. 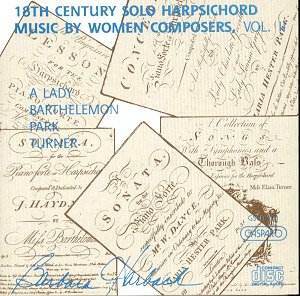 Unusually she ascribed opus numbers to her relatively few compositions but retired from composition when she married. We have here a Concerto and a Sonata by her. The solo part in the Concerto includes an orchestral reduction � if the full arrangement for keyboard and band proved impossible � and this is how it�s played here. It�s an extremely well crafted work, as one would expect of someone of Park�s background. Though the outer movements are splendidly confident � especially the wittily off centre finale � it�s the Andante that most catches the ear. This is a beautiful lullaby, effortlessly lyrical. It put me in mind of the keyboard writing of James Hook. Her Sonata in C major has plenty of technical prowess behind it interspersed with her trademark lyricism. The slow movement is slight but the finale has an attractive episode in the minor � which survives even the rather telegraphed nature of it. Finally we have two Lessons by Elizabeth Turner, which are derived from A Collection of Songs With Symphonies, which contained nineteen settings. The Tambourine Allegro of the G minor is particularly enjoyable in its key modulations and the Gavotte of the G major sports real incision and style � the other movements tend to sag. Barbara Harbach, who provides the notes to which I�m indebted, has performed a real act of reclamation and plays with style, grace and character. Recommended to inquisitive explorers of the repertoire.